The residential curriculum is a framework designed to guide the work of student housing staff in our residential communities. The purpose of the curriculum is to enhance student learning and development while supporting the mission of the university. The curriculum helps student housing staff and others on campus to answer the question: What do we want students to learn as a result of living in our residential communities at the University of Mississippi? 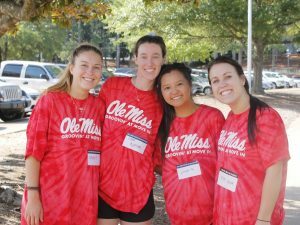 Through transformational and purposeful experiences, students living in residential communities at the University of Mississippi will become engaged scholars and responsible citizens. We offer many opportunities, from conversations to events, for engagement in our residential communities. All of our work with students is aimed at aiding their development as engaged scholars and responsible citizens. Below are strategies for accomplishing our goals. Intentional interactions: Residential learning staff get to know our students and help them as they adjust to life in college. Staff members provide guidance and celebrate important milestones with our students. Passive educational opportunities: Student staff create opportunities for students to learn on the go through chats, information tables, and bulletin boards. Community learning plan events: Residential learning staff, university partners, and special guests work together to plan large community events designed to enhance students’ on-campus experiences and connect the lessons learned in the classroom to life on campus. Community builder events: Student staff regularly host small events designed to foster social connections among residents. Events may include group fun runs, community bake offs, video game tournaments, board games, arts and crafts, and coffee and conversation nights. University partners: Our university partners offers events, workshops, socials, and other activities designed to help students get involved, meet other students, and gain skills both in and out of the classroom. Our university partners bring resources into our communities, and our staff and students attend events led by various offices and departments. Leadership opportunities: Students have multiple opportunities for developing leadership skills through the Residential Housing Association, which is our student-led governing board. Student involvement: We love hearing our students’ ideas for events and activities! We encourage students to work with our residential learning staff to develop new opportunities in our communities.